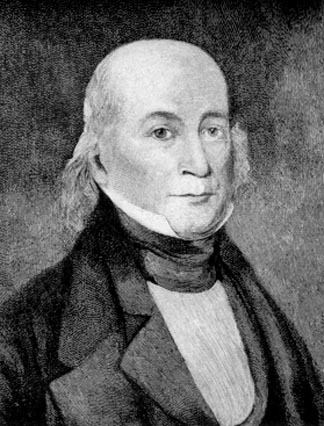 When the Academy of Natural Sciences of Philadelphia was established in 1812, Gerard Troost became its first president, to be succeeded in this position five years later by William Maclure. Troost was one of the scientist who joined Maclure in New Harmony in 1826. The following year, Troost left New Harmony for Tennessee, where he became a professor at the University of Nashville. In 1831 he was appointed first State Geologist of Tennessee. He held both positions until 1850. Perhaps Troost's most enduring influence on scientific progress in New Harmony took place in the fall of 1836. During that time, David Dale Owen, having just finished work for the M.D. degree, observed Troost's methods in the geological survey in Tennessee. With that experience, Owen returned to New Harmony and conducted the first geological survey of Indiana. Soon thereafter, Owen became a United States Geologist, and later, the State Geologist of three states, Indiana, Kentucky, and Arkansas. Troost amassed a collection of minerals and fossils purchased for $20,500 in 1874 by the Louisville Polytechnic Society. The Troost Collection now reposes in the Louisville Science Center. Henry Grady Rooker, "A Sketch of the Life and Work of Gerard Troost," Tennessee Historical Magazine Series 2, vol. 3 (1932) 3-19. John M. Nickles, Geologic Literature on North America 1785-1918, Part I. Bibliography, U.S.G.S., Government Printing Office, Washington, 1923. Image of Gerhard Troost used by permission of Smithsonian Institution Archives, RU 7177, George P. Merrill Collection.